Election season is in full swing across America, and political tensions are hotter than ever. You know what a pivotal moment like this calls for? A little drama and comedy to lighten the mood. Let’s look back at a gentler day and age when the Great Depression and Fascism were the only big worries, and when politicians made headlines for being unfaithful to their spouses rather than to the Constitution. I’m talking of course about the 1930s and 1990s, respectively, and today’s Movie Matchup of Mr. Smith Goes to Washington and Dave. So let’s journey to the nation’s capital and see how these two enjoyable films compare. A regular guy gets put into a high government office to replace someone who is either dead or dying. A manipulative person pulls the strings behind the scenes. A hardened woman slowly warms up to the main character. The main character tries to put an ambitious project into action. He spends all night coming up with a plan. He is charged with a crime he didn’t commit, thwarting his hopes of doing something meaningful. He thinks of giving up and skipping town. 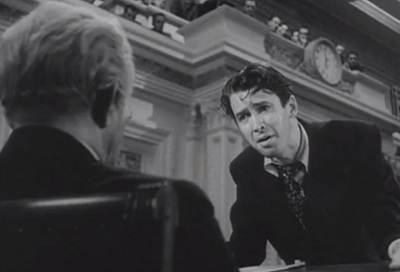 A showdown in Congress ends with the main character passing out. Both films focus on an average guy who is put into an extraordinary situation when he is selected to replace an elected official who is either dead or catatonic. In Mr. Smith Goes to Washington, Jefferson Smith (a man with no experience in government) is selected by the governor of an unnamed state to replace a recently deceased U.S. senator. His naiveté and independent spirit get him into a lot of trouble, but they also give him the strength to overcome great challenges. In Dave, a small-town man named Dave Kovic just so happens to look exactly like the U.S. President, so he is selected to pose as the President to hide the fact that the President is having an affair. Unfortunately, that night the President suffers a massive stroke, which leaves him brain dead. Instead of alerting the nation to this tragedy, the President’s Chief of Staff calls Dave into the White House and tells him to continue his charade a little longer. Dave is frightened, but he agrees to do it because he believes it’s in the nation’s best interest. A ruthless man who craves power tries to control the naïve main character. Jim Taylor has every politician in his state in his pocket, and he tries to put Jefferson under his control in order to pass a lucrative piece of legislation. When Jefferson resists, Taylor and his cohorts bring down all sorts of retribution on him, but we’ll get to that later. In Dave, the aforementioned Chief of Staff Bob Alexander puts Dave in place just as a figure-head, but he signs legislation and performs other official acts in secret, leading to problems for Dave. Alexander’s real goal is to manipulate the situation in a way that will assure his election as the next President. A woman who is disillusioned by the world of politics slowly but surely befriends the main character and helps him navigate some rough patches. Clarissa Saunders is Jefferson’s assistant and at first she can’t believe that he is so enthralled by the majesty of Washington, D.C. The city (and its power) lost its significance to her long ago when she learned how easily its residents are corrupted. When Jefferson shows his eagerness to learn and do something good rather than bow to the wishes of Taylor, she takes a liking to him. She helps him craft a bill and stand up for himself in ways he wouldn’t have been able to without her valuable coaching. Dave’s first meeting with the First Lady doesn’t go well. She can’t stand her husband, so of course she gives Dave the cold shoulder. But then Dave starts to treat people with kindness, and he goes through a huge effort to save a cause she’s fighting for (more on that in a minute). All of this changes her mind about him and it also clues her in to the fact that Dave is not her husband. She sticks with him, though, keeping up appearances and helping him make a key decision to stand up to Alexander (more on that later, too; boy, I’m such a tease in this article). The main character spends all night coming up with a plan of action. After a few days in the Senate, Jefferson decides to take action and draft a piece of legislation. He doesn’t know the first thing about doing that, so Saunders stays up all night with him to craft the bill. They also stay up all night another time toward the end of the film to help Jefferson save his reputation. After Alexander secretly signs legislation that cuts funding to an orphanage that the First Lady wanted to keep open, Dave decides to do something about it. He calls his business partner and they go through the federal budget line by line to find millions of dollars to cut from other areas and put toward the orphanage. It’s a nice commentary on government largesse and how difficult it can be to get things done in such a complicated system. The main character proposes an ambitious project that he’s unable to put in place because of unforeseen problems. The bill Jefferson crafts is meant to create a new National Park for young people to go to and learn about nature. Coincidentally, the location of the proposed park is where Taylor plans to implement a wasteful spending project. This leads to a head-on collision between Jefferson and Taylor. Dave thinks about all the good he could do while pretending to be the President, so with the help of the First Lady, he comes up with a plan to put everyone in the country to work. However, the specifics of his plan are never revealed and it comes across more as a liberal fantasy than a practical reality. But it’s supposed to endear Dave even more to the First Lady and put him more at odds with the cold, calculating Chief of Staff, which it does. 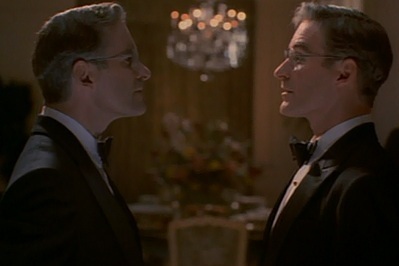 The villain pushes back against the hero, accusing him of crimes he didn’t commit to slander him. Taylor forces the senior Senator from Jefferson’s state to accuse Jefferson of attempting to profit off his bill, even though that was Taylor’s plan all along. 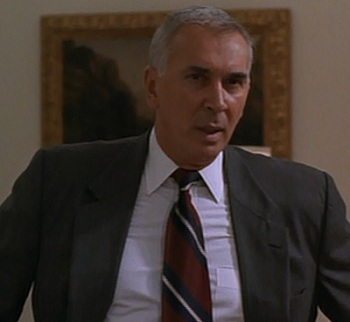 In Dave, Alexander testifies against the President, claiming that he committed several crimes while in office. Dave didn’t commit those crimes, but the President did. With all hope lost, the hero seriously considers sneaking off in the night. Jefferson becomes disillusioned by all the false testimony thrown at him in court. But before he can run away, Saunders stops him and convinces him to stay and fight. In Dave, after the First Lady figures out that Dave isn’t her husband, she decides to leave town before things get even more out of hand. But in this case, it’s Dave who stops her and they convince each other to stay and try to make a difference while they have a chance. The climax occurs in Congress, and it ends with the main character falling unconscious. With Saunders’ help, Jefferson takes the floor of the Senate and exercises his right to filibuster all day to give children in his home state time to get the word out about Taylor’s corruption. Unfortunately, all his efforts appear to be in vain, and he finally collapses in exhaustion. At the last minute, though, he’s saved by the senior Senator who admits that he and Taylor are at fault, and Jefferson is entirely innocent. Dave calls a joint session of Congress to lay out all the evidence that proves the President is guilty of heinous crimes, but so is Alexander. With one fell swoop, he dashes Alexander’s dreams of becoming President, and he condemns himself. But he has a Get Out of Jail Free card in the form of pretending to pass out and switching places with the real President in an ambulance on the way to the hospital. Thus, Dave won’t be held responsible for the President’s crimes. Aren’t happy endings great? Mr. Smith Goes to Washington and Dave offer interesting what-if scenarios. Just as The Matrix hypothesized what would happen if people could download martial-arts skills without training their bodies to be able to perform those moves, these two films show what might happen if someone made it into high office without going through the rigors of the democratic process. The end result is revealing. Without all the attack ads, campaign promises, and other things that seem to be required to get elected, Jefferson and Dave are pure in heart and naïve. They just want to do good, but they’re unprepared for the dangers that seem to lie around every corner. Dave tries to one-up Mr. Smith Goes to Washington by making the hero the President rather than a Senator, having him address both houses of Congress instead of just the Senate, presenting more ambitious legislation, deepening the romantic angle of the story, and much more. Both films succeed in what they’re trying to do. Mr. Smith Goes to Washington restores even the most cynical citizen’s faith in the U.S. Constitution, and Dave tells an engaging and sometimes moving story of how one man can make a difference. These movies remind us to enjoy the blessing of life, liberty, and the pursuit of worthwhile entertainment. All images are the copyright of their respective copyright holders. This entry was posted in Movie Matchups and tagged comedy, films, government, movie review, movies, politics, romance, united states. Bookmark the permalink.